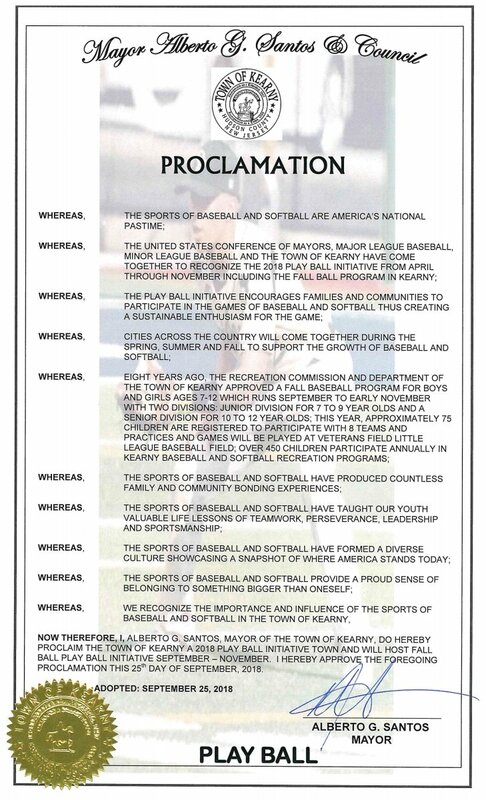 During the Regular Meeting of the Mayor and Town Council Tuesday, September 25, 2018, Mayor Alberto G. Santos issued a Proclamation designating the Town of Kearny as a 2018 Play Ball Town and announced the Fall Ball Program for children. Play Ball is a joint program from MLB and USA Baseball that focuses on the fun nature of baseball and softball and encourages widespread participation in baseball and softball related activities. The primary goals of the Play Ball program are to reach children who don’t normally play baseball or softball and encourage them to participate in sports and to continue to engage children that enjoy playing sports. Mayor Santos, in partnership with the United States Conference of Mayors, encourages mayors to work with their recreation departments or local Boys and Girls Clubs to create sports program opportunities for children and to engage youth, citizens and families to organize activities that teach sportsmanship, leadership and team work. The sports of baseball and softball have taught children valuable life lessons of perseverance and a sense of belonging to something bigger than oneself. The Fall Ball program runs September through November at Veterans Memorial Field in the Town of Kearny. Residents interested in Fall Ball program registration may contact the Kearny Recreation Department at (201) 955-7983.